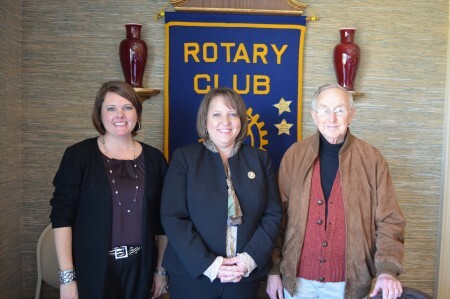 The Auburn Rotary Club recently hosted Jan Hume (center), director of Alabama’s Office of School Readiness. Established by the Alabama Legislature in 2000, OSR establishes collaborations with pre-kindergarten programs throughout the state to provide Alabama's 4-year-old children with effective early childhood experiences and prepare them for school. Currently, the program, which is considered a national exemplar, includes more than 215 pre-K programs, for which the state provides technical assistance, teacher training, and classroom funding. Pictured with Hume are Club President Martee Moseley (left) and program host Bill Walsh (right).